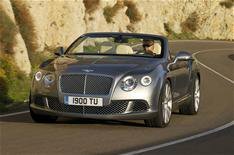 Bentley Continental GTC review | What Car? What is it? The Bentley Continental GT coupe was given a full refresh last year with a new look, and a full suite of technical improvements. Now it's the turn of the open-top GTC version to get the same treatment. So, the twin-turbo 6.0-litre W12's power and flexibility have been upped a little and the standard six-speed auto 'box has also been tinkered with for faster gearchanges. Naturally, it also includes the same interior changes as the coupe. So there's a new-look dash, better seats and a vastly improved infotainment system. There are additional changes that are specific to the GTC. These include enhanced body stiffness, designed to eradicate the wobble and shake you sometimes get with cabrios. There's also more room in the back than in the outgoing version, a better insulated cloth hood and a 'neck warmer' to keep the chill out when you've got the roof down. What's it like to drive? It isn't as good to drive as the GT, but it comes admirably close. At speeds up to 30mph it isn't as adept at soaking up bumps and you can detect some shimmies through the steering wheel over larger scars. Get above that though and it's remarkably supple, quiet and poised for such a big heavy soft-top, in any of the four electronic chassis settings. It's fast, too. Even with a light throttle there's more than enough flexibility from the 6.0-litre to pile on speed without drama. Floor it and it's supercar swift and you also get rewarded with a well judged engine note. It's loud and sonorous enough to let you know what's under the bonnet, but always restrained and never harsh. Roof-up refinement is extremely impressive. It's just as quiet as in the coupe at all bar huge speeds. Just like the coupe, though, it isn't agile. Yes, the steering and the chassis changes have done enough to improve things a bit, but the Bentley doesn't feel totally at ease being thrown around too quickly. That said, it does feel extremely stable and composed, which is far more of a virtue for this sort of car. Latest video news from What Car? What's it like inside? The changes to the GT's interior were far more necessary than changes to the exterior, and it's the same with the GTC. The cabin layout is better than in the outgoing model, and it hasn't lost any of its charm or amazing craftsmanship in the process. Front-seat comfort is first class, and things are now much better for those relegated to the rear, too. Changes to the front seat design have liberated a little more rear kneeroom, and the back seats are easier to climb into and out of. You still don't get as much shoulder space as in the GT however and it does feel a mite claustrophobic if the electrically powered roof is up. Should I buy one? We always thought that the GTC made a bit more sense than the GT, and had less obvious rivals. That hasn't changed with this new one. If you're in the market for the ultimate luxury soft-top it comes close to being ideal. The way it looks and drives is incredibly well judged for most who will want one. One caveat, though, is that a new, cheaper V8 model will be available next year, and that could be even better.